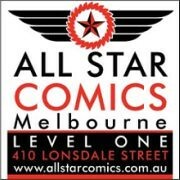 I mentioned last month that I would be attending the live recording of the 75th episode of the NonCanonical Podcast, which was held last Saturday night at my local comic shop, All Star Comics in Melbourne. I was very privileged to be a guest on the night and to be able to donate a prize on behalf of Action Figure Blues. It was a great night, with a big crowd packing out All Star Comics and owners Mitch and Troy making excellent hosts. NonCanonical's Joe, Josh, Kane and Larry were all in fine form. It was quite surreal to watch something I'm used to just listening to, and yet on another level it wasn't that different from a normal episode. It had all the usual whackiness and free-flowing conversation we've come to expect from a great NonCanonical Episode! The podcast is now up on the web and can be downloaded here. Alternatively, you can search "NonCanonical" at iTunes to download Episode 75 or any other earlier episodes, and subscribe for future eps. I've had a listen and it has come together brilliantly! If you'd like to check out a great set of pics from the night, Gestalt Comics' Bobby.N has a great post up at his blog. 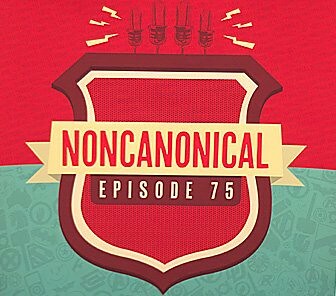 Congratulations to the team from NonCanonical, and here's to another 75 great episodes! Huzzah! Great stuff Andy. I may just take the plunge into podcasts now.